Happy Halloween! If you know me, then you know that I absolutely adore the novel and movie Practical Magic. It's one that I watch at least a few times a month and try to fit in my schedule all too often during September and October. I just adore it and find so many references to things I love in my own life, much like my burning love for Outlander. Do you have a book that just sits on your heart and is special to you always? I simply cannot get enough of it. During my pregnancy, which was probably the loneliest time of my entire life, I watched the film almost every day at night before I fell asleep. I really bad habit, I know! But it comforted me; I felt really connected to Sally who longed for a simpler life and was left alone with her children. Oh man! So thankful that I get to live that wonderfully simple life, growing herbs, making remedies, and writing about it. It's an absolute dream, even on the hard days! If you have never read the novel, you definitely should! We will actually be reading it next October (that seems like a lifetime away!) for our UATR Book Club. I am really excited to start that next week! Head over to the book club page to see what our reading schedule is. In the novel Practical Magic it mentions the Aunts of Sally and Gillian making a special black soap that was healing for your complexion! There are only a few references to it, but from what I could find, they only made it twice a year. It was the only thing the girls grew up using, making their skin milky and glowing. The soap was only sold at local shops and hard to find; apparently it made many people envious as well as making the Owens women strange. I absolutely love that kind of stuff! And I searched desperately online for a recipe for the Owens black complexion soap to no avail. There's not a whole lot out there! I called up my friend Cara of Wild Farm Soap to help me make a simple handmade soap at home! We had such a fun time, and let me tell you, we must be super women because there were three screaming toddlers running around while we made and photographed these bars of soap. I mean, they turned out pretty good for the circumstances! Even amid chaos, there is simple beauty. Also reality. Lots of reality! I met Cara about 6-8 months into writing this blog, before we started gardening and keeping chickens. She actually was a reader that emailed asking if we might have wanted to take some laying hens off of her hands! At the time, we didn't even have a coop to put them in, but we decided to meet up for coffee and talk chicken anyway. Little did we know that we would become instant friends and sat in that coffeeshop for several hours talking away! I love how this little internet space has brought so many wonderful people into my life; it's like a soulmate discovery tool. Cara owns her own business called Wild Farm, where she makes handmade, all natural batch glycerin soaps. They are absolutely beautiful and smell heavenly! In fact, she created two signature scents specially for our shop at the beginning of the year. We love them so much! She, her husband, and four children also own a small farm where they raise non-GMO, pastured chickens and pigs. We'll be teaming up next year to start a CSA together! I just love her. Please check out her online shop and try her soap out! I realized quickly after learning that I really wanted to make this magical black complexion soap, I had no idea where to start! I asked Cara if she minded showing me an easy recipe, one anyone could do at home to get started, to share on our blog. Of course, she said yes! This soap is actually made with a pre-made natural base, which is awesome for the quick crafter. I was appreciative of that! If you are wanting a more luxurious and amazing soap (though this one is pretty awesome!) definitely head over to Cara's Etsy page and check out what she's got going on. 2 mini loaf pans, about 5"x3"
In a stove pot used only for natural crafting (though this is washable! ), melt your glycerin soap base over the stove on low heat. Stir occasionally with a wooden spoon until melted completely. In a large bowl, pour the melted soap base and carefully stir in the activated charcoal. It should mix in easily and become a very intense shade of black. Let the mixture cool to at least 110 degrees Fahrenheit. Drop in your essential oils. We used Melaleuca (tea tree) as it is great for healing oily/acne-prone skin! You may use whatever you like, such as rose or calendula, which are great for healing your complexion. 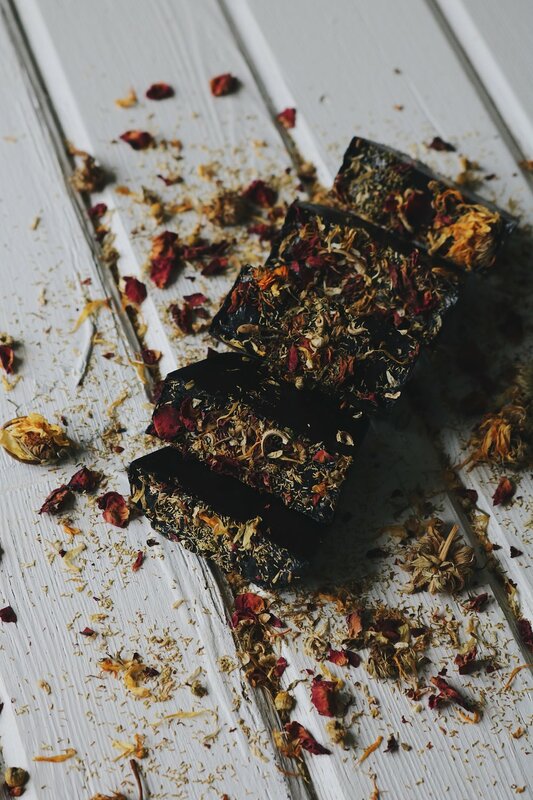 If you wish to make the bar with exfoliation in mind, you may grind up your herbs finely and mix them into the soap as well! They will settle at the bottom or the top of the bar after they harden. Pour your soap mixture into your prepared pan. You will want to choose a nonstick pan to shape your soap, such as a muffin tin or a loaf pan. For this amount, two mini loaf pans worked great, and I think a large loaf pan would have worked well too! Once the soap is poured evenly, with about a 1/2 inch of headspace, sprinkle your herbs over the top before it hardens. It will harden quickly, and you may gently press the loose herbs into the surface of the soap so they stay in tact. Let harden overnight, or at least 12 hours. If you are using the same size loaf pans that we did, then they will be ready much sooner! Once completely dry and solid to the touch, place the soap in the freezer for 15 minutes. This will make the removal process much easier! After freezing, pound the soap out with your fist or a small sledge hammer, and it should pop out easily. You may want to take a sharp knife and insert it carefully around the edge to help it pop off. With a sharp knife, slice the soap into 2 inch wedges. You may lose some herbs in the process! Make sure to really press them into the soap before it hardens. Use this bar on your face and body, as it will help to heal your complexion. I love that I had the opportunity to learn from a master soap maker how to get started! This is seriously so easy to do, and I think it works great for any beginner who would like to learn how to make a simple soap at home, free of lye, and just as wonderful to use. And how beautiful did it turn out?! I am in awe! I love using dried herbs on soap, especially when they come from your own garden! Looking for dried bulk herbs? We now sell them in our online shop! How awesome is that?! You can buy each of the herbs used in the recipe online from us. They are grown in our own garden or locally sourced from small farms near us. Love it! I think you will really enjoy making this. One thing Cara reminded me of is that glycerin likes to sweat. It naturally releases moisture, which helps to moisturize your skin, and will sweat if left someplace warm. It does not go bad or anything like that. That just means its working! To keep your soap the best way that you can, store it some place dry and where it is able to get air after being used, like a soap rack or dish. I hope you enjoy making your own witchy black soap at home! It's so fun! Want to buy some of Cara's yummy handmade soaps?! Click HERE!